veryone deserves the opportunity to realize their dreams. That’s why Prospera Credit Union created its Educational Awards Program. Whether you’re a young student about to embark on new educational adventures or a mom looking for a chance to go back to school; Prospera can help by putting a little extra money in your pocket. Whether you’re a young student about to embark on new educational adventures or a mom looking for a chance to go back to school; Prospera can help by putting a little extra money in your pocket. Prospera has more than $20,000 in Educational Awards to give away in 2016 to deserving students in communities from Vancouver to the Okanagan and the awards are open to both new and existing Prospera Credit Union members. Individual awards are valued from $1,000 - $2,000 within five different categories and the deadline for applications is March 1. In 2015, the $2,000 Ron Sweeney Rising Star Award was presented to Sydney Torok from Sardis. This award is given to one exceptional high school student pursuing post-secondary education. Sydney is in her first year of studies at the University of Victoria and plans to pursue a career as a Clinical Pharmacist. 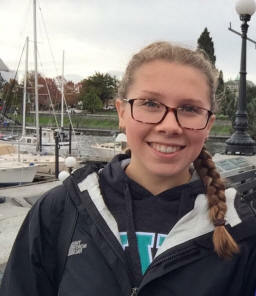 An athlete and certified life guard, she is also a dedicated community volunteer and active member of the Rotary Interact Club in Chilliwack. Watch a video of Sydney talking about how scholarships are helping her achieve her goals. Applications for the Prospera’s 2016 Educational Awards have been sent to high schools and post-secondary institutions throughout the province and are also available on Prospera’s website at www.prospera.ca along with complete details about the program. Each application must be accompanied by a short video. The Credit Union Foundation of BC also offers a variety of bursaries and education awards for students in BC, funded by credit union members. Last year, Prospera members received more than $4,000 as a result. The deadline for applications for the winter semester is February 15. For information on these awards and an application form, visit www.cufoundation.org. Prospera Credit Union supports education in other ways within our community as well. In 2016, Prospera will continue to partner with Junior Achievement to deliver their Economics for Success program which encourages middle and high school students to take a closer look at the advantages of staying in school and how the choices they make can positively impact their future dreams, aspirations and outcomes. Building on more than 70 years of history in British Columbia, Prospera Credit Union is proud to be a member owned co-operative with operations from Vancouver to Kelowna. As a full service financial institution that prides itself on building relationships, we serve our members through sixteen branches; online and mobile banking; and a locally-based contact centre. Through our membership in The Exchange network, our members enjoy access to more than 3,300 surcharge free ATMs across Canada (that’s right, no ATM fees). Making life better for everyone is important at Prospera. With an extensive community investment program devoted to supporting the organizations, events and volunteers that make our communities stronger, Prospera makes a meaningful difference in the financial well-being of our members and our communities. To learn more, check out Prospera’s YouTube channel and Facebook page or visit the credit union’s newsroom online at prospera.ca.